Marketing strategies have changed over the years, the focus is different to what it used to be but most of the main principles remain the same. One of the tools that is used for marketing techniques and strategies is the marketing funnel. The marketing funnel is a visual adaptation of a customer’s journey from being totally unaware of your brand to (hopefully) becoming a loyal customer. 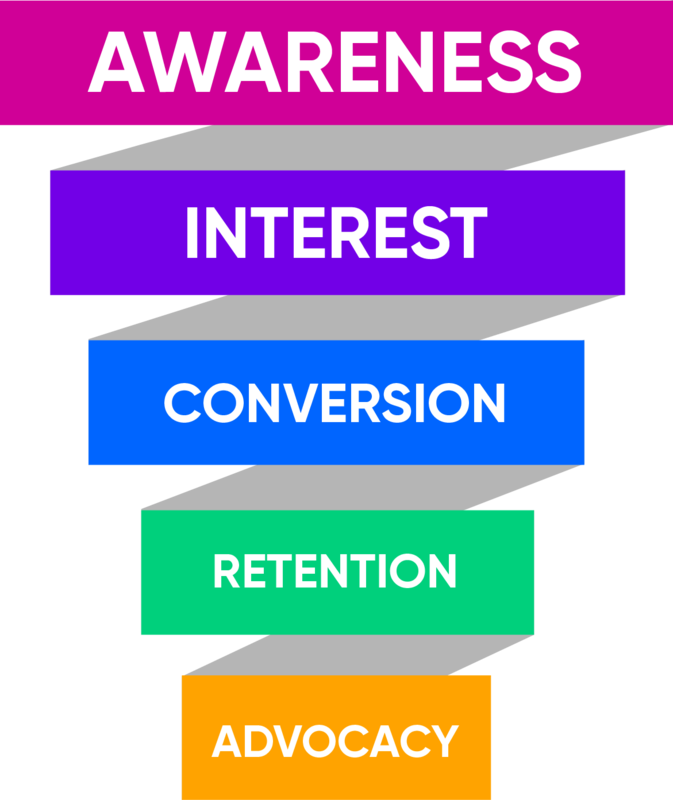 Most Marketing funnels start with Awareness. This is the first stage and it includes SEO (Search Engine Optimisation), Advertising, Social Media, Blogs and videos. It’s basically anything that brings your business to a potential clients attention and gives them something to interact with. The Second stage is usually Interest/Consideration. This is the stage where a potential customer has shown interest in your company, so you send out targeted Ad’s, emails, targeted social media campaigns and newsletters. It is at this point that you have some information on the customer and you want to turn this interest into a purchase. You want to keep the information relevant and focused on building a relationship with the customer rather than overselling. The next stage is Conversion/Sale at this point you want to turn that interest into a sale. You are converting the lead into a customer. Special offers and targeted advertising can help turn this lead into business. The next point is Retention/Loyalty, you want to deliver a good service so that that customer is happy with their purchase. You have done the hard part which is turning the lead into a customer, now you need to reward this with loyalty and nurture the relationship. Your post purchase behaviour is very important now, promotions such as discounts on the next order in return for a review of the product can help to grow this relationship. The final stage is Advocacy if you have given the client a satisfactory service then they are likely to pass on this information. Feedback and Client Testimonials are so important as they feed potential customers back into your funnel. People are much more likely to trust a recommendation from a friend or family rather than a marketing campaign, no matter how good it is! At this point, if all has gone as planned then customers will be promoting your business via the various social media channels, blogs and newsletters.